Dogstival is a fantastic family festival for dogs and their owners that will be held in the heart of the New Forest on Saturday 18th May and Sunday 19th May 2019. The festival will take place in the stunning grounds of Pylewell Park, near Lymington and boasts over 2000 acres of woodland, open fields, lakes and even it's own beach! 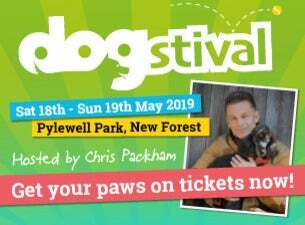 Dogstival will be hosted by wildlife enthusiast, proud dog owner and local resident, Chris Packham. Visitors will enjoy a weekend cram packed with exciting arena displays, dog shows, expert talks, fun dog activities to try like flyball or agility and our own unique Dog Behaviour stage. Plus, fabulous shopping and delicious local food producers, live music and a vintage children's fun fare to keep the kids entertained.